Candles are renowned for their ability to add light into an area, but they also act as a decorative element. Depending on the purpose and the ingredients used in making candles, the cost price may not be pocket-friendly. But you need not to worry; you can make your candle at home! But great and durable candles get made with quality ingredients like good wax. Are you wondering what best wax for homemade candles is? Then you may need to continue reading as this article will give details of the best wax you can use to make your candles at home. Since the medieval time, candles have always gotten made from different oils, fats, and waxy-like substances from insects, plants, rocks, and animals. According to scientists, the wax is a substance that is a hydrocarbon in structure, water repellent, has low toxicity and odor, contains a smooth texture and, solidifies at room temperatures. But not all waxes are ideal for making homemade candles. The following list includes the best wax available on the market for making great and durable candles at home. See also our concept of smell like your state candles. Check here the materials, instructions and other information on making candles at home using the best waxes in the market. The wax gets packaged in a container and blended with a 2% additive from Universal Soy Wax. What’s interesting is the fact that the wax makes long lasting candles. Are you wondering why? Because it has a melting point of 121 to 125. If you love some good smell, then this is the wax to use in your candle making. It can hold 15% fragrance and offers an incredible hot throw. You may be the type that loves something attractive. With the Candlemaker’s Store 05417002641 Natural Soy Wax, 10 lb. Bag, White, you can create beautiful tarts by blending it with the 416 wax from soy. Have you been looking for natural wax? Then this wax is meant for you. It gets made from beeswax and is 100% organic. You need not to fret about the safety of this wax; it gets certified before releasing it for sale. Besides, it gets manufactured by Sky Organics, a renowned reputable company in the USA. The wax comes as filtered and in the form of Grade A pellets according to USDA guidelines. They get made by natural, healthy honeybees in a pesticide-free and non-GMO environment. You might think that the wax pellets are complicated to use, but you are wrong. The wax comes as pastilles, meaning there are no large blocks to cut. It also melts quickly. If you love the sweet aroma that comes naturally, then you will enjoy the natural smell that comes with this organic beeswax pellets. Besides, you will fall head over heels with its snow white color. 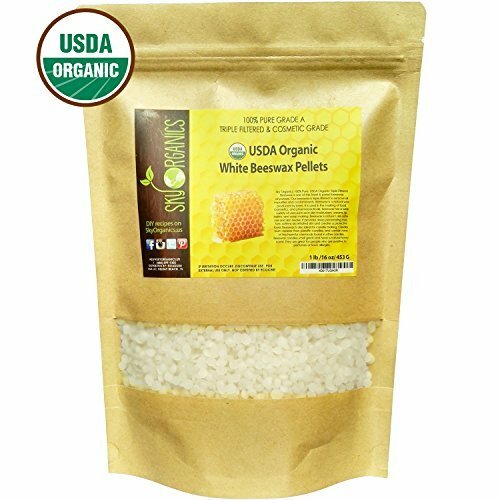 Sky Organics USDA Organic White Beeswax Pellets is ideal for DIY projects such as making candles, cream, lotion, lip balm, skin care, crayons, deodorant, and furniture polish. What’s impressive is the fact that it comes with a money back guarantee. It comes with a natural scent only while some users may prefer other artificial fragrances. Are you tired of using candles that emit chemicals? With candles made using Organic Candle Making Bundle Kit, you need not fear about inhaling any substances. It gets manufactured in the United States of America and comes as a 2lbs of 100% natural beeswax. It is ideal for making candles at home and comes with a 2.0mm thick candle wick. What’s fantastic about the wick is the fact that it gets created with organic hemp and coated with beeswax. Organic Candle Making Bundle Kit comes with 200 pieces of wick sustainer tabs that contains 16mm thickness in diameter. Fixing the wick is like a downhill task. You get to customize the wick length easily, and attaching it to the sustainer tab is easy. The neck height is 7mm, while the wick hole is 2.5mm. It burns consistently with a low-temperature flame that consists of no smoke. 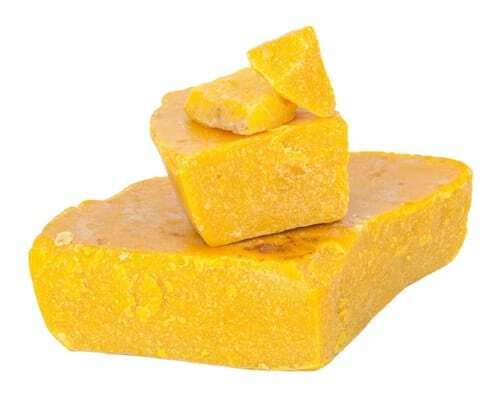 If you are the kind that loves natural aromas, then you will like the sweet smell that comes with this wax. Besides, its golden yellow color is appealing to the eyes. You might worry about value for your money, but you need not to. The manufacturer offers a 100% satisfaction guarantee. 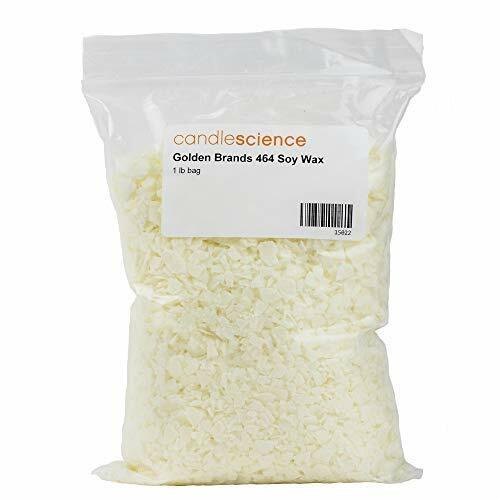 Having been made by CandleScience, a renowned company in supplying the best DIY candle making wax in the United States of America, you get guaranteed of top-notch quality wax. What’s even surprising is the fact that you can also combine it with other supplies like base, soy wax, fragrances, and melts. For example, you can mix a bag of soy wax with 1oz fragrance oil. You need not to measure the soy wax as it comes weighed as a 1 pound bag. The manufacturer is conscious of the environment and packs the wax in a recyclable and biodegradable package. The wax’s flake form makes it easy to use. May not be pocket-friendly for some users. It could be your first time to make candles at home, and you have no idea of what’s required other than wax. 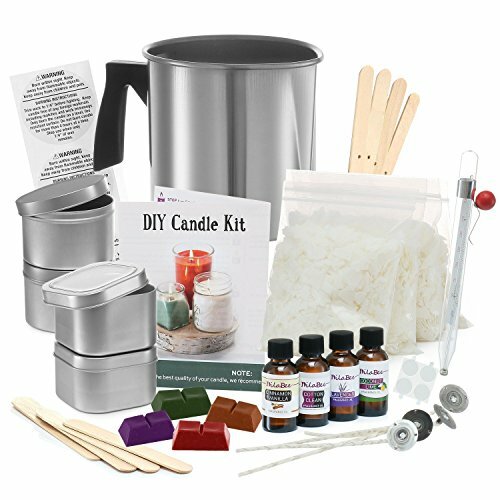 You have no reason to put on a dull face; a Complete DIY Candle Making Kit Supplies is all you need! It is a starter kit ideal for the first-time candle makers. It comes with everything necessary to make four beautiful candles. The kit includes four glue dots, fragrances, cotton wicks, bow tie clips instructions, warning labels, soy bag wax (4-8 oz.) and stirring sticks. The set also contains two round and covered square candle tins. What’s interesting is the fact that this kit is ideal for everyone. It doesn’t matter whether you are a pro or a beginner; this DIY kit will enable you to fill your room with a glow of beautiful candles with a heavenly scent. Besides, it comes with instructions to ensure no mistakes get done. Do you love colors? Then you will like this homemade candle kit. You get to make candles in color green, red, lavender, or orange. If you love scents, then you will enjoy making candles with this kit. It comes with Cinnamon Vanilla, Lavender, Clean Cotton, and Coconut Lime scents for your candles. You only get to choose the scent or color of your preference. Besides, candles made using this kit are no different from the high-end candles as the supplies are of premium quality. You got no reason to worry about spending your hard earned dollars on this kit; it comes with a 100% satisfaction guarantee. If you love colored candles, then this wax dye is meant for you. It comes as flakes and in a variety of colors. You only need to choose the color of your preference. You can also become innovative by mixing colors to create a unique but attractive appearance on your candles. Using this dye is easy; you just mix 0.02oz to 0.06 oz soy flake dye with a 1 lb candle mass for full color and vibrant candle. 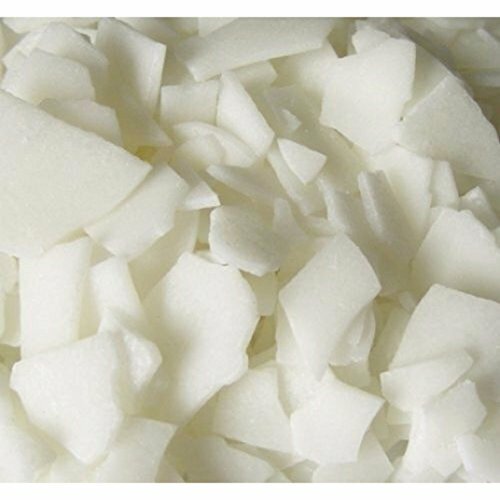 It is suitable to use in paraffin and wax bases. What’s interesting is the fact that candles with these wax dyes don’t clot, and the surface of the candle do not tarnish with time or flake. The kit comes with 16 wax dye packs made from premium quality. The wax dye gets mixed after a few minutes of melting the candle chip. The fact that they are animal-friendly, non-toxic, gentle, stain free, irritant-free, and safe to the skin makes them safe and impressive. Your money gets well protected; thanks to the full payment guarantee that comes with this wax dye kit. Packed as flakes, making them easy to use. What Kind of Different Wax Exists? It may be your first time to make candles at home and are wondering what type of candle wax will suit making the kind of candles you want. With the many different types of candle waxes available on the market today, choosing the right candle wax can be a daunting task. But the following insight of the various candle wax will help you in making the right decision. It gets made from petroleum and costs very little. As a result, paraffin candle waxes are generally very cheap. If it’s your first time making candles, paraffin wax gets recommended as the best to use. 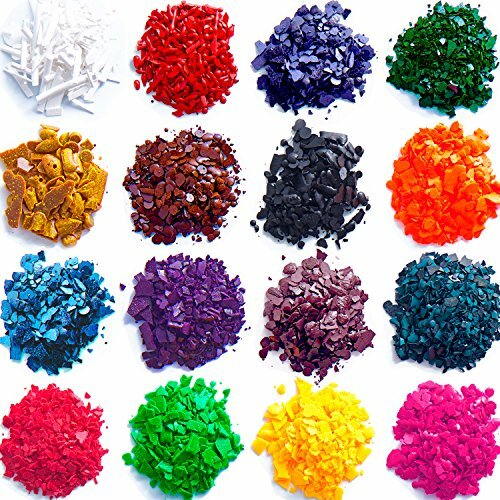 Dyes and additives work perfectly with paraffin wax. Unfortunately, it is not biodegradable, and is hard to dissolve, making it hard to clean on spilt on surfaces like carpets. You may need to use a particular chemical to clean it out. Check out also our complete guide on the best natural bath additives. Cream wax is a mixture of oils and paraffin. It is opaque and soft, and gets specially designed for jar or container candles. But gel wax comes as clear and see-through, even when dyed. Candles made with gel wax looks terrific. For example, they can get prepared with suspended glass fish in them and with underwater scenes. But gel and cream waxes cannot stand on their own, and that’s why they get poured in jars or containers. Unfortunately, you cannot use some fragrance oil in gel wax. It also burns in high temperatures and requires a thick container or jar; a thin one will explode. Cream wax is ideal for beginners in candle making as it is easy to use. If you require beautiful candles, gel wax works out best and is suitable for making special occasions candles. Soy wax gets made from hydrogenated soybean oil. The advantage with soy wax is that it’s easily accessible, easy to clean, and affordable. But it’s not ideal for first-time candle makers as it does not get the hang on easily. It also burns out fast and is not good with scents. But no need to worry; when mixed with other waxes from plants, it becomes suitable for scent tarts. If you suffer from any allergic reactions, soy wax is not ideal for you. Just like its name, it’s a vegetable wax from palm trees. Because of its hard feature, it is ideal in adding hardness to soy wax, but costs higher than many other candle wax. The bayberry bush contains berries with a waxy coating that get used in making the bayberry wax. To extract the wax from the seeds, they first get boiled and the wax collected from the water top. A lot of berries get involved in making the bayberry wax and is a long and tedious process. As a result, bayberry wax is among the most expensive candle wax. If you are looking to make a candle that does not break easily, then this is not the wax to use. It is brittle, causing it to break easily. But no need to worry as you can add beeswax to help sort this problem. But if you are the type that loves a pleasant scent, bayberry wax’s smell will blow your mind away. It’s ideal to use in making candles used for special occasions like on Christmas or New Year’s Day. Beeswax is gotten from the honeycombs and burns longer than other candle waxes. Unfortunately, it is costly compared to other waxes. It is also not ideal for decorations, and you may find yourself looking for cheaper options to make beautiful candles. But unlike other candle wax, beeswax burns with a pure white and bright flame that appeals the eyes. The other candle wax burns with a yellow glow. Beeswax sticks to the surface, making it hard to clean when it spills. If you prefer colored candles, beeswax is not ideal especially if unbleached. For dyed candles, you may need to use soy wax. 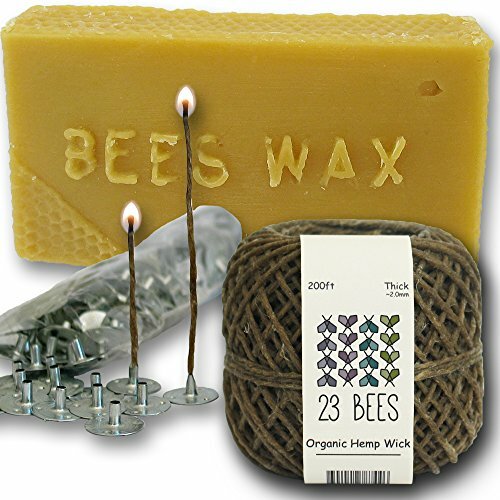 Also, candles made by beeswax require wicks larger than those used in candles made with other waxes. It is suitable for small and hand-sculpted candles. Is There a Better Wax for Candles? All waxes are ideal for making candles. What matters are the purpose and budget? For example, if it’s your first time to make candles, you may need to use the paraffin wax. If you have a small budget, both waxes get recommended. For beautiful and decorated candles, gel and bayberry waxes are ideal. Palm wax is great in hardening other candle wax. For long lasting candles, beeswax gets preferred because it has a longer burning time. Depending on why you are making the candles, any of the wax illustrated above is ideal. How Do The Wax Get Melted? All candle wax comes in solid form, and they need to get melted before use. Fortunately, melting wax for making a candle is like a downhill task. You can use a microwave or a double boiler. Start by breaking the wax into small pieces if not in pellet form. A sharp knife can help. Put the wax flakes in a container ideal to use in the microwave and set the wax’s melting point. Then start on the microwave. If you want to use a double burner, fill a big container with an estimate of 2inch water. Then put a small bowl with water into the bigger one and place on fire. For safety reasons, it gets recommended that one should use an electric stove and not gas. Then add the pieces of wax in the double burner and heat for 10-15 min at medium-low heat. Remove when all the wax melts completely. Where Do You Put The Melted Wax? After the wax gets melted completely, pour it in the candle jar or container. Don’t forget first to stick the wick using a suitable adhesive before pouring the melted wax. Points to Consider Before Buying Wax for Homemade Candles. Consider the following factors before purchasing any wax for making a candle. Candles come as container, pillar, tealights, and votive. Wax ideal for making a candle depends on the kind of candle you want. For example, pillar candles require wax that shrinks to release it from the mold. Wax designed to settle in a container or vessel is ideal for making container candles. Consider the quality of the candles you want to make. If you need cheap and easy to make candles, you should go for cheap wax like paraffin wax. For durable candles, consider buying wax that has a long burnt out time like beeswax. Waxes from natural sources are biodegradable and safe for humans. Artificial wax may contain toxins that are harmful to both animals and the environment. If you are the type that loves scents, you should consider wax that maximizes a scent throw like the paraffin or soy wax. A blend of the two waxes also works perfectly. Making candles at home may be cost-effective and fun, but you need to use the right wax for a specific candle. If you are not sure of what wax to suit the kind of candle you want to make, the examples illustrated above can help. Consider the factors listed above for best homemade candle wax. You may also check hereour complete guide of the best bath and body works candles.